Sometimes a new business strategy or product strategy forces a company to make changes to their product. In some cases it’s simply the packaging of the product that is changed. Either way any of these new product design ideas mean that the manufacturer likely wants to get rid of old stock products off the shelves in the grocery stores and retail big box stores to make way for new product packaging. I often wondered if the same product was on the shelf and you would see a new and improved label on a product whether the earlier product was any good or not. I’m sure they mean that their other product was great but this is even better. I’m not sure but for the most part they need to keep the product fresh, up to date and appealing to the customers. What is a marketing strategy? For the most part to me it means they want to find the best way to communicate a new or improved product to the customer, get our attention to purchase items and that means finding appealing ways to do it. It might mean product testing, new packaging and special prices. New product innovation is important even if the product is not new but they will make it seem like it is to the consumer with minor changes. You may also find with product strategy size may shrink or even get bigger or the ingredients list might change. I know many of you have talked about noticing product packages shrink. Where you may have found a product in the store last week it may change this week meaning shelving placement, display placements etc. It’s all about attracting the customer to the new product even if it’s not a new product, it just looks different. It’s all about the money and just the other day my wife mentioned how at the corner shop candy has shrunk since she was a child and the price has gone up. It’s no different with any product if prices go up to make the product either they raise their price, replace ingredients with a lesser quality ingredient or shrink the product. Yes we need to factor inflation into the equation but sometimes we see product prices keep soaring. The good thing these days is that product pricing wars are happening at almost all the shops around so it’s easier to score a deal because they are all fighting for your business. Just as technology changes and we rush out to buy the latest model same goes with every day products at the stores. Whether you buy something that is new and improved or the same product but with a new twist the product strategy might change just to get your mind thinking, I need that. It’s always hit or miss finding products like this because you don’t know when they will be removing them and replacing the old packaging with the new products on the shelf. How about that Hellman’s Mayo with Balsamic Vinegar or Franks Red Hot sauce with lime… there’s always something new and improved or just new. Sometimes these new products might not go over well so they discount them and get rid of them or try to find out why and make changes so they are new and improved. You may also find they discontinue product sizing as well just like we noticed last night at the grocery store. 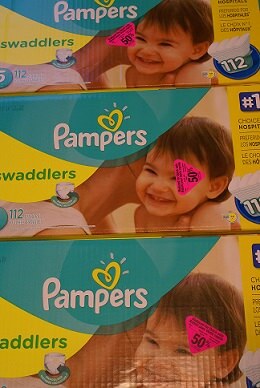 The photo above of Pampers Swaddlers size 5 were sitting in the reduced shopping carts with pink stickers. We wondered why that would be, so we took a gander over at the baby section and noticed that they no longer carry this package size for Pampers. They carry size 5 Pampers Swaddlers just not the packaging with 112 diapers inside. Now, what they did have was a smaller box of size 5 diapers regular price $29.99 on sale for $22.99. These boxes that have the pink stickers the cashier told us they are no longer carrying that size diapers as they have a new package and size box in stock for size 5. The regular price on the jumbo box was $44.99-50% = $22.49 which means if you are a smart shopper and have a child or will have a child in size 5 diapers this is a great deal. You will be getting more diapers in the box and the price is cheaper than the sale price on the new smaller Pampers Swaddlers sized boxes. 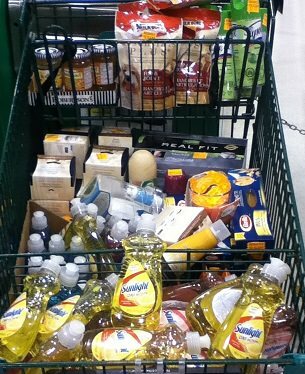 There was also a full shopping cart of Sunlight dish soap that they were no longer carrying and it’s mainly product size because they do still sell the larger bottles. Not all products are discontinued due to packaging issues some just don’t sell and they want to get rid of it. If you know your prices and products you can easily look on the reduced racks and know straight away what’s a deal and what’s not a deal. The problem here for most is that is you must do the math like we did with the diapers. You have to go and find the product and see what prices are on the current products and sizes to find out if it’s a great deal. Sometimes they may try to pull the wool over your eyes and you think you are scoring a deal on a discontinued or product with older packaging but you’re not. I remember about a month or two ago walking around Zehrs and I know some of my grocery game fans might have scored this deal. They had shopping carts filled with Tide laundry detergent that sell for $8.99 or more reduced to a price of $2.99. We thought wow that’s great especially if you pair it with a coupon. 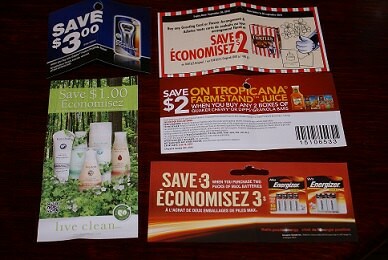 I’m pretty sure there were Brandsaver coupons out at the time for $1.00 off. We looked down the laundry aisle and sure enough the same Tide products were on the shelf BUT the packaging had changed just a bit. So, if you are a smart shopper you can score some deals on products that are being marketed with new labels, containers, ingredients etc. as long as you do the math and make sure you are getting the best price possible. Do you buy reduced products because of product strategy or new and improved changes on the original product? NEW!! You can now download the FREE Canadian Budget Binder Budget Spreadsheet in Excel…Grab it while you can… It’s FREE! 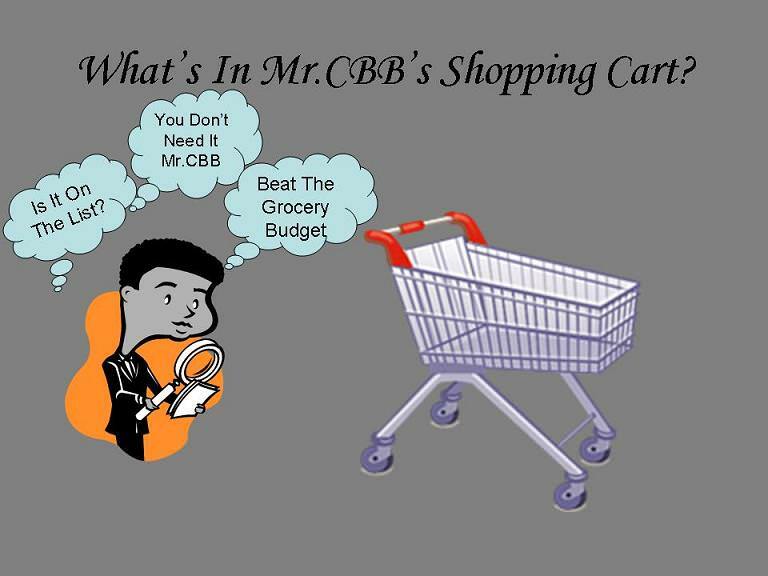 We use it to budget…check it out! 2x Philadelphia cream cheese (big containers) $2.88 ea. 3x Yellow onions Sale $0.88 ea. 2 x bags of Basa Fillets Sale $5.99 ea. 2 x seedless cucumbers Sale $0.88 ea. 2 x Rudolphs Bavarian bread sale $2.00 ea. Weekly Overview: Well we spent more than we anticipated but we are well stocked up on cheese, milk, fish, bread.. all sorts. I’m confident we will be able to stick to our grocery budget for the month plus we have a few dollars yet to spend in our stockpiling budget. Does your mobile phone control your life? Our weekly budget is $125 a week and $500 for the month. Well stocking up on laundry soap is a necessity for me as i have a family of four and three pets!! i must do at least a load of laundry a day :S. I only have an android phone so i only have check out 51 and snapsaves. I have no interest in getting an apple phone to get the other apps. My wife has an ipod so we just use that for the apps. We don’t have any fancy phones either. I shop for 2 adults and a 3 ½ year old boy. Our budget is $85/week or $425 for this month and includes laundry, health/beauty, etc. My shops for the week were here and there, mostly Foodland, a stock-up trip to Canadian Tire and hubby had me drive him into Stratford as he upgraded our internet package and that meant a new router and for our older boy to do the updating on the computers in house. Figured while I’m there I would grab the new flyer for No Frills and Shoppers for a change. I was over for the week but I still have room left in the budget to see through to the end of the month without too much trouble… I hope. So there you have it….Over $29.04 for the week. I did get the coffee that was on sale at Canadian Tire. $6.99 was too good to walk away from especially as lately it’s been going for $7.99 on sale… The good news is I still have over $330.00 to last the rest of the month. I did get a flyer for this week coming for Shoppers and No Frills so I will be going to both places on our way home Sat. I also have included here the two saucepans I got with my stickers, quite the discount on those and they are really nice heavy pots!!! Sweet deal for $2.00 each!! In spite of going over for the week it looks like I am in good shape for the rest of the month, just wish I could say the same for my freezer as it’s getting low on meat. Makes meal planning a little tricky….I worked with the straight $162,50 for the week as I was under enough last week to absorb the overage from last month. In all honesty even when it comes to certain produce that have the pink stickers, I’ll grab them when I’m eating them that day or was just coming in for a grab and go snack. It’s funny how some people think these products are “bad” now that they’re reduced but instead there are great savings to be had. I’ve noticed the downsizing of packaging for a while now. If I can get the old packaging at a reduced price I’m there. I always check out the reduced cart at the grocery store, I got a number of small bags of organic rice a while back for $.99, not sure what the original price was as there was no longer a space for it on the counter so I’m guessing it didn’t sell well and was being discontinued. My gain…. If you can score a great deal, why not. As long as you know the price it’s important to know if you are getting that deal. In your case it sounds pretty obvious you are. Another super tight week and trying my best to stay on top of it. We will be running very low on many veggies and fruit after this week, so a no shop week won’t happen next week, but I will try to keep that one small too and perhaps sneak a trip to the U.S. this weekend into our schedule for cold meat, cheese, milk and bread (I’ve been too busy to make bread lately and the U.S. fund is healthier than the food budget) so we can apply more to the fruits and veggies in town. I am staying on track to buy mostly healthy stuff and eating some out of the freezer – like the turkey on Mother’s Day, but I am totally craving some pop (particularly the caffeine and the bubbles) and I may cave a bit next week, just a little for us both since we both need to be more weaned off of the caffeine. Hubby is doing his best to eat much better for health reasons and it has given me the “out” to not buy the junk or somewhat junk type items. However, U.S. side, we will buy a bag of Keebler cookies for my kiddo, I want him to be healthy too, but not punish him for our income right now. We started into a gift card that we have been holding onto for dire months. I would call May and June our dire months now that I found out yesterday that I will have to wait two more weeks later in June (June 28) for E.I. to kick in – I’m still hoping to go back to school in the fall, so the super tight food budget will be good practice again. June will be crazy tight too. However, I discovered a gift card that I got for Christmas to spend on myself from RCSS with printing of photos in mind. It has $12.12 left on it from $25, so happy dance, we have just that much more to apply to grocery gift card category. My mom is the only one outside of my immediate family (and this website, lol) who knows how bad it is right now brought me a container of my favourite local honey for Mother’s Day. It’s amazing, 5 years ago we had a grocery budget of $30 for three of us. Granted, my son eats more now than he used to, big difference between 3 and 8 years, but really the huge increase in the budget is the rising cost of food, particularly vegetables (and we have to watch the carbs now, so potatoes which was my easiest to stretch now has to be reduced dramatically). It’s been really hard to try and get back to the $30 weekly, and it can’t be long term. I’ve stopped checking the clearance rack, other than fruits and veg which are my first place to go, unless there is something specific I need to buy. I just won’t be buying from it and if I don’t look, I won’t be tempted. 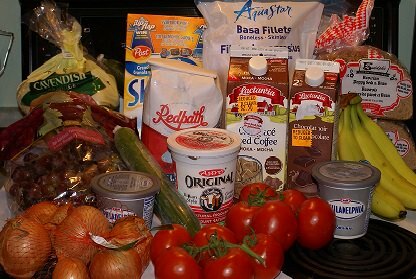 It seems like a $30 grocery budget is out of this world, even for five years ago, but it really wasn’t that tough and we often had money left over that I would just set aside for one big stock up shop of pantry items that we ran out of. It’s things like lettuce, cucumbers, mushrooms, tomatoes, broccoli, cauliflower, onions and carrots that really sock it to our budget now. I can’t even look at a cauliflower unless it’s on the half off rack at RCSS, $3.97 a head is awful or even the large portobello mushrooms which seem to be above $4 a package now. Those items 5 years ago were reasonably priced, healthy eating made easy and the junk was more expensive. I cringe every time I pick up celery and lettuce for 1.79. Some things you can get on sale still for great prices, like button mushrooms, but the sales aren’t often enough for the fresh produce to get a good price regularly. My brain seems stuck on my previous budget in a way that I want to get back to it, but it seems impossible to do so now. Shopping the sales is helpful, but it doesn’t get a balance into the house like it used to. Bonus find on the movie gift card Mr. CBB. I love those just as much as the ones I find to use for groceries. I tend to hang on to them for some time, once I part with the movies ones, the next trip to the theatre seems so far away. This week is predominantly about shopping a couple of sales and scoring a rain check at Thrifty’s for 1.36 L Heinz Tomato Juice cans at $1.99 each. We use a lot of tomato juice, especially in the summer, so this is an exciting rain check for me! I can get Barilla gluten free pasta here locally and even if it is rather pricey, my hubby likes it. It allows me to space out my cross border shopping trips out to suit myself and I do not have to run across the border simply to get something that doesn’t taste like cardboard. Gluten free products are certainly improving as the competition heats up. If I had to develop a sensitivity, I sure picked the right time to do it. Safeway has a nice price on fresh corn on the cob this week (6 ears for $3) but the stuff they have in the store is absolute garbage – it’s not a deal if it’s not worth eating! There will be other sales now that summer is almost here. I can wait, right? Right??? I am happy to say that hubby and I are doing a “Borscht Run” late August this year! My cousin and his wife invited us to a local event in Grand Forks, BC so we are driving up and will try to squeeze in a a little visit with my relatives in both Castlegar & Grand Forks while I replenish my borscht supplies. So, if you look at the $1,343.14 calculation that we have spent in 2014 and subtract the $250.00 we have actually saved in our “reserves” and the $149.42 we have recorded as spent but is actually set aside for future USA grocery shopping… we have actually only spent $943.72!! That is still under the $950.00 we budgeted for January through May. The surplus is not available for spending on the week-to-week shopping though – it’s buried in our reserve funds for future needs. Ok, Heinz it is… I’ll keep my eye on it going on sale and pick up a can so I can make the fastest soup in the world. I just love your quickie route. I’m always pretty suspicious when I read about “new and improved” formulas — particularly when it comes to food. What new technology have we discovered that could make food taste any better? But yes, I would definitely buy closeout versions of the same product. Most of the time, it’s usually just a change in design rather than usability, and the prettiness of a package isn’t terribly important to me.